it starts with ingredients chock-full of japanese style excellence, and ends with sesame dressing. there are a lot of foods i like. in fact, i would be willing to venture that in this world, there are only a handful of foods i really don’t like, and even those i can eat on occasion. but among all of those food that i like, and even among those foods that i profess to love, there are few that can compare to the egg. in the words of my older brother, “it’s like a whole meal came out of a chicken.” eggs are proof that nature wants us to be healthy. besides, everybody knows that if an animal is delicious, its babies taste even better. it’s a rule of nature. or something. and because eggs are so great, it logically follows that putting two on top of a burger with a plethora of other exquisite fresh ingredients would make good enough to deserve an epic title. so now it’s history time. coined in the nara period, “yamato” was the name used to refer to the nation of japan before its islands had been unified into a single state. but trust me, this burger ain’t named after no old word. it is named after the battleship that carries the same moniker. the yamato, the first of the yamato-class battleships, was one of the largest battleships ever constructed. it had a displacement of 72,800 tonnes. it had nine 18.1 inch main guns. it was a beast. granted, it was sunk by thirteen torpedoes and eight anti-carrier bombs towards the end of world war ii, but that doesn’t change the fact it was huge and terrifying. and, much like the battleship, this burger takes a lot to finish off. mince half of the onion and the cloves of garlic super finely. this is important. if your mince is not fine enough, it can cause your burger to fall apart in the frying pan or on the grill, and that is no good at all. introduce your ground meat to the onion and garlic, and add in a splash of olive oil, hot pepper, a healthy smattering of dried basil and dried oregano, and salt and pepper to taste. mix it with your hands. be a man, you can clean your nails later if you need to. in my humble opinion, here is the trick to a great burger. put your meat in a tightly sealed container of a saran-wrapped bowl and set it in the fridge for 30 minutes to an hour. this allows the flavors to sit and mature, and will make sure that the distribution of spices is complete. while i personally have no problem with an unexpected mouthful of garlic, most people do not find it desirable. don’t skip this step. slice any remaining onion you may have as thin as you possibly can. transparent when raw is the goal. take this opportunity to cut the roots off of your kaiware and rinse them under cold water. let both sit in a colander to assure that they don’t introduce any water to your burger. lastly, remove the base from a few stalks of green onion and chop them nice and fine. add some sesame oil to a pan, get it medium-hot, and add two eggs. make sure not to let the oil get too hot or it will burn and be terrible. sesame oil isn’t like vegetable oil, so don’t treat it as such. immediately give the eggs a hit of salt and pepper, and little bit of hot pepper if you like. cover, and let them cook until the whites are done. if you want to cook the yolks through, go ahead and break them. if you are down to get messy, leave them intact and cook your eggs until they are over medium. when finished, set them aside on a plate and cover them to keep in the heat. nobody like lukewarm eggs. toast your buns. remember, don’t overdo it. 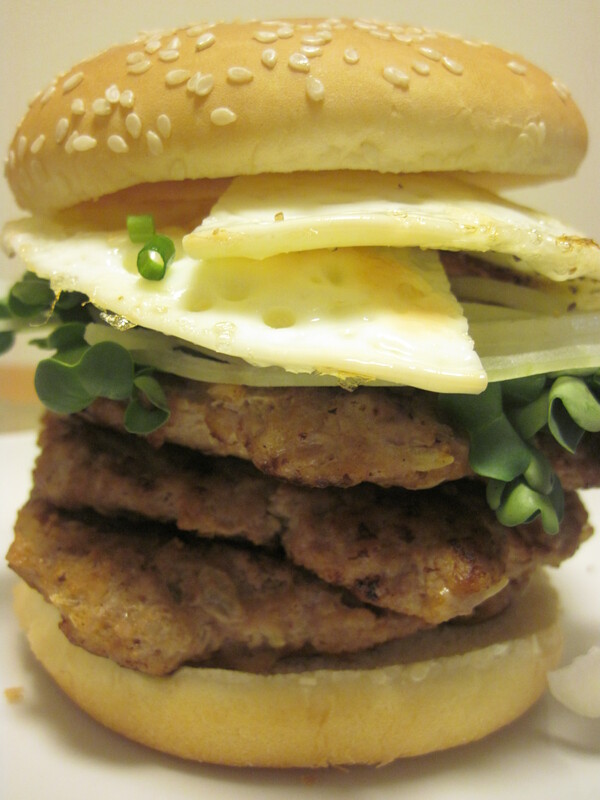 bun, three burgers, kaiware, onion, sesame dressing, two eggs, green onion in that order. do some mouth stretches during assembly, you’ll need them. make some world war ii analogies during mealtime. beer. i won’t pretend like i’m inventing something new. i’m just remind you of what you already know. beer and burgers go together like japanese school girls and boy bands.